With a menu that truly changes with the seasons, it’s hard to keep up with Duskie Estes and John Stewart, the husband and wife chefs of this eclectic establishment. Best to check in with them to see what’s cookin’. Although I would make a bet anytime you go you will have some mighty tasty food. The owner chefs raise their own pigs and cure their meat, making salumi and sausages. Together, they were crowned “King & Queen of Porc” at the Grand Cochon at Aspen Food & Wine, 2011. They also produce their own wine with Thomas George Estates: Black Pig Pinot, Blanc Pig and Pink Pig that is highlighted at their restaurants. Oh yeah, they own and operate Bovolo in Healdsburg too. Zazu is located right off Hwy. 12 just outside of Sebastopol. Set back from the road, it looks like a former chicken coop! Indeed, it was in a former life. Rustic is an over-used term. Let’s just say the interior is much warmer inside than out. But, if you suffer from claustrophobia, you might object to the rather low ceilings. It can get a bit noisy, too. We went for dinner on a cold winter night and were immediately welcomed upon arrival and shown to a charming table near a window. 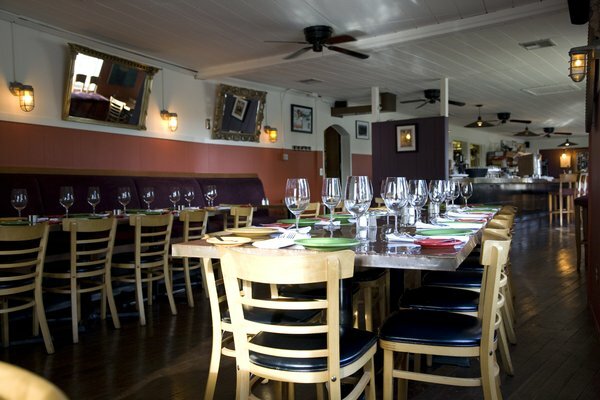 The dining room is long and a bit narrow, so be prepared to sit close to nearby tables. Actually, it felt cozy. The wait staff was very helpful with the menu items and cheerful. We were off to a good start. House-made breads of pumpernickel and corn muffins arrived while we scanned our menus. “Dates Wrapped in Bacon” ($2.25 ea ****) caught my hubby’s eye for a starter and I ordered the “Crab Salad on Endive with Tobiko“($15****). The Dates in Bacon was like eating candy first! 10 more please! Fantastic flavor combo of a roasted date with bacon wrapped around it. Yum. The Crab Salad and Tobiko was excellent with a healthy portion of crab, too. Next, Juniper Crusted Venison ($29****) with celery root pommes anna and cranberry salsa for me and J.B.’s Balsamic Pork Shoulder ($19.95****) with melting onions and mashed potatoes for hubby. Before I describe the food let me again tell you that the service we received was extraordinary. 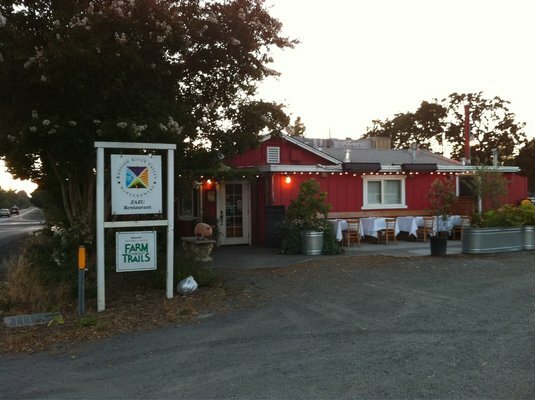 Hubby described it as, “Gary Danko – of Sonoma County.” Danko being our favorite restaurant in the City. Like Danko, there is a true team spirit exhibited — wait staff circulate the dining room and check in with different tables, they are not just assigned to a certain area; and everyone who spoke to us was genuinely warm and friendly. They made us feel special. Even Duskie made her rounds, stopping by tables, pouring patrons wines. So much for uppity chefs — none here. Okay. The food. Simply said, it was terrific. The venison was perfectly cooked, medium rare and the presentation of this dish was well executed. I love pommes anna and these were delicious. The cranberry salsa complemented the gameness of the venison, as did the glass of Black Pig Pinot I ordered. Excellent depth of flavor with lots of fruit. J.B.’s Balsamic Pork Shoulder was succulent, served with melting onions and potato mash. All in all, a very satisfying meal. We were happy, happy. I highly recommend this restaurant for a special occasion or, casual evening. It’s a kick-back place with lots of kicked-up food! Get Thee to Zazu and see what’s cookin’.